Gold medal winner in 1995 and 1996 and the Chicago Beverage Tasting Institute. UPDATED: MAR 22, 2019 March Madness 2019 - Not my style. Not a bad Belgian...but nothing I really like. UPDATED: FEB 21, 2019 I hate to say this, but the first thing I thought of when I tasted this was 'Blue Moon'. Not in a bad way, but MUCH better than Blue Moon...just reminded me of that citrusy Belgian-style that so many domestic brewers are shooting for. This is how it should be though! Flavors are full but in a balanced way. Nice and hoppy too. Appearance is more in the medium brown side, cloudy but not quite thick and murky. 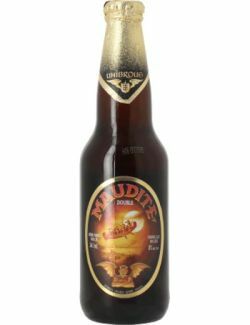 Something like this straight from Belgium would probably be in the $4-6 range, so figure I'm getting the North American discount. Go Unibroue GO!! Keep brewing and I'll keep sampling. UPDATED: JAN 8, 2019 Bonne bière foncée s'apparentant à une rousse avec un goût prononcé et épicé sans trop d'amertume. Un bon 8% qui nous amène à faire perdurer la dégustation et à savourer chaque petite nuance de la bière. UPDATED: DEC 21, 2018 Moins complexe que la précédente cela reste néanmoins une grande bière par sa puissance aromatique, son coté torréfié et épicé, des notes maltées et une bouche à la fois riche et équilibrée, avec une bulle onctueuse et une longue finale tout en équilibre. Une terrible bière d'hiver. UPDATED: NOV 5, 2018 Opaque. Colour is a rusty brown. Head has little lasting power. Aroma is rye bread and caramel. Taste is Christmas cake and plum. UPDATED: NOV 10, 2018 Bottle. It pours a murky copper color with a tall tan color head. The aroma is caramel, bready, and dark fruits. Very smooth. Tasty. UPDATED: OCT 3, 2018 A bottle from my colleague on return from leave in Saskatchewan, cheers James! Aroma: malt, dundee cake. Appearance: opaque oxtail soup, head quickly dissipates to nothing. Palate: full bodied and sticky, soft carbonation. Complex, predominantly sweet finish. Taste: heavily sweet and bitter, well balanced. Paprika, some vanilla. Satisfying and unassuming, the 8% ABV sneaks up from behind, a well-crafted beverage.